Looking for some affordable family fun in the Phoenix area? You’ve come to the right place! I’m so excited to share this awesome deal with you for a POGO Pass (*for which I am an affiliate)! 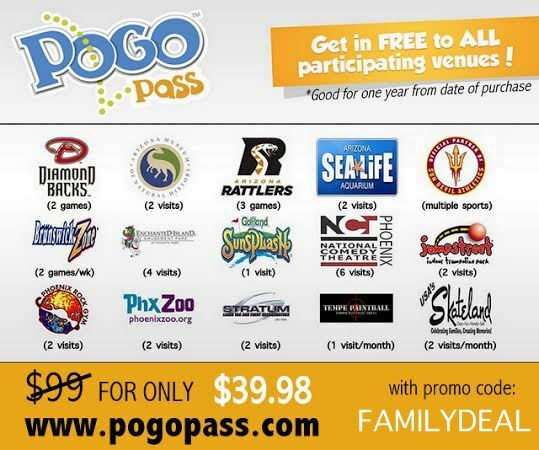 Pogo Pass is a membership that provides you 12 months of FREE access to the best entertainment venues in Phoenix. Check it out: SO many awesome Phoenix area venues, right?! The pass is good for 12 months from the date of purchase and normally sells for $99 each. But, using the FAMILYDEAL promo code, you get passes for just $39.98 each! To purchase: Go to the Pogo Pass website and use the code FAMILYDEAL to get each pass for just $39.98! A family of four (or a family of five like us with a young under 3-year old who does NOT need a pass) would need to purchase 4 POGO passes totaling about $160 with the FAMILYDEAL promo code. If that family was going to go to Sunsplash for just 1 day, admission would cost $100. Then, a single day regular admission visit to Sea Life Aquarium for that family would be $62. So, just utilizing the Sunsplash visit and one (of 2) Sea Life Aquarium visit already totals more than the POGO passes – everything else is literally FREE! So, don’t miss out on this sweet deal! I’m super excited to start using it this summer to have fun things to do with the boys! Each person needs their own pass. Pogo Passes are not transferable and each one will have a name on it. (Venues may ask to see ID). Children under 3 however do NOT need a pass! Most of the venues listed above don’t starting charging until age 3, so there’s no need for the littles to have a pass. You will receive your tickets via email to print off, but you are also able to access your passes on your smartphone. Venues can scan the barcode on your printed pass or off your mobile device. Be sure to check the POGO pass website for any restrictions! Each venue has all the details outlined. What venues are you most excited about on the POGO Pass? Thank you SO much for sharing this. I just bought our passes and I’m about to email it out to everyone I know. The summer just got even more fun!!! This post is old, is your promo code still good for the POGO pass? if not do you have a current one?